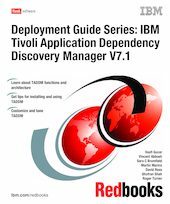 In this book, we provide insight into the TADDM V7.1 capabilities and architecture. We include recommended procedures for installing and configuring TADDM, tips and techniques for populating the TADDM database and customizing its use and performance considerations. Finally, we cover the sales engagement planning for TADDM V7.1, including a sample statement of work. The primary audience for this section is Business Partners and pre-sales Systems Engineers working in this area. This book is a major reference for IT Specialists and IT Architects working in TADDM V7.1 projects.